Honey itself cannot compete with well-framed words. 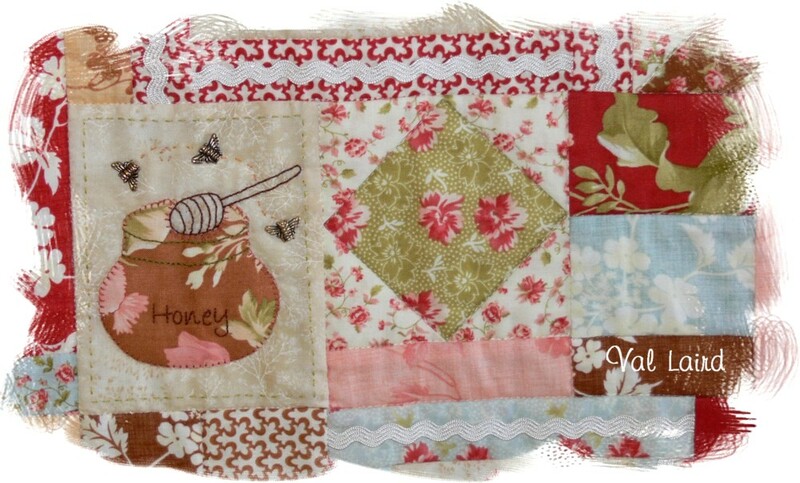 If you have chosen to make the modern version of the quilt, you will need to download the modified template for this block as it is a different shape. Download here. Talking about honey, I have a confession - I don't eat it! I'm not at all a fussy eater. I enjoy all food and I can only think of two things that I don't eat. And honey is one of them. My mother could not tolerate the smell of honey; it actually made her retch. Combine that constant sight in my childhood with the fact that if my brother and I ever had a high temperature and were feeling terrible, we were given a crushed aspirin in a teaspoon of honey, and you can imagine the aversion to honey that increased with each year ... and I still can't eat it! 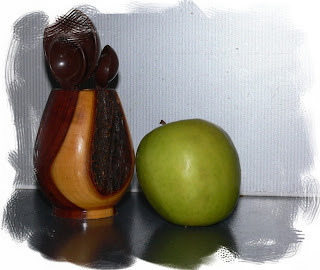 Back to "Apples of Gold" - I want to tell you about lots of apples that have been in my kitchen lately. They are not the golden type, but one of my favourites, the Granny Smith. I love their 'sweet tartness' or 'tart sweetness' and they are such a fabulous apple for cooking. They are one of Australia's gifts to the world! I find their story really interesting and you can read some of it in my grandson's fabulous blog, Ten Random Facts. My husband and I love to have stewed fruit on our cereal for breakfast, so I bought a case of Granny Smiths while they were at a good price. A few hours of peeling and chopping later and I had 14 lovely bottles of fruit preserved. That's another three months of breakfast fruit! They will be rotated between plums and peaches - yum! There have been a couple of other bits and pieces too which I'll show you some other time. Happiness is having completed projects to show! This block looks so lovely Val! Thankyou for sharing these patterns with us all. Love the new block, Val, thank you so much!!! I love honey - my crushed aspirin never had anything added to it but water, so I never came up with that aversion, lol. Your fruit looks wonderful, I love Granny Smith's too! 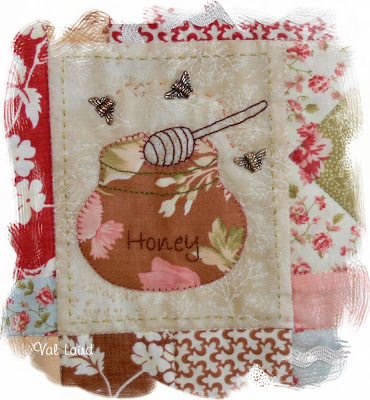 I love your honey pot Val. I remember being given medicine is a spoon of jam - same idea - but at least I still eat jam... Gorgeous block and silk ribbon work. wheat free and gluten free LOL. THanks for sharing with us again. Thanks for the lovely patterns and inspiration. Thank you for block 7. It is so cute with the little bee charms. I was interested in seeing your canning jars, because they are different from the ones I use here in the U.S. I always like to see things like that. Sounds like you have plenty of good things canned for a few months! Mary Ann, I will send you the pattern if you contact me by e-mail. Unfortunately you are a "no reply blogger", so I can't contact you through your comment.